Origin and Habitat: Distribution: USA, Southern Texas ( Cameron, Hidalgo, and Starr counties) and northern Mexico (Coahuila, Nuevo León and Tamaulipas ). Type locality: Thickets along the Colorado River, Texas. Altitude: Sea level to 550 metres. Habitat: It is the northernmost species of the genus, occurring in thorn shrub vegetation and coastal lowlands under Mesquite scrubs, along with Astrophytum asterias, Mammillaria heyderi, Echinocereus stramineus, Wilcoxia tamaulipensis and Homalocephala texensis. Echinocactus setispinus var. cachetianus Labour. 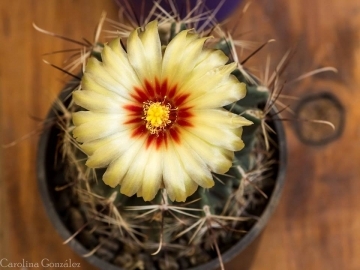 Hamatocactus setispinus var. cachetianus Labour. Thelocactus setispinus f. cristatus hort. 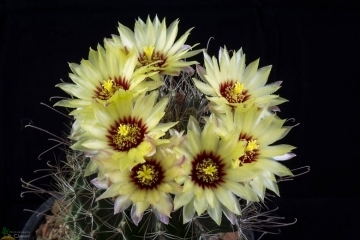 Hamatocactus setispinus f. cristatum hort. Echinocactus setispinus var. mierensis K.Schum. Echinocactus muehlenpfordtii Fennel in Otto & A.Dietr. Echinocactus setispinus var. muehlenpfordtii (Fennel) J.M.Coult. Echinocactus setispinus var. orcuttii K.Schum. Thelocactus setispinus var. robustus Poselg. Echinocactus setispinus var. setaceus Engelm. Thelocactus setispinus cv. brevispinus hort. Hamatocactus setispinus f. brevispinus hort. 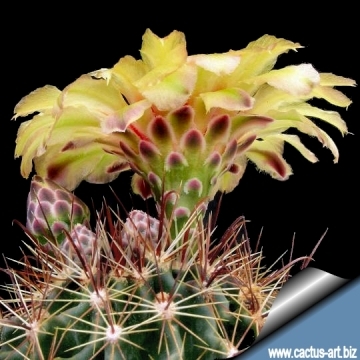 Description: Thelocactus setispinus, best known as Hamatocactus setispinus is a well known cactus species that produce a succession of large silky flowers in summer and autumn. It is quite variable and has had at least 30 scientific synonyms, none of which recognized. The stem sizes vary from one population to another and the extreme forms are certainly very different.. At one time, two separate varieties based on size were recognized. 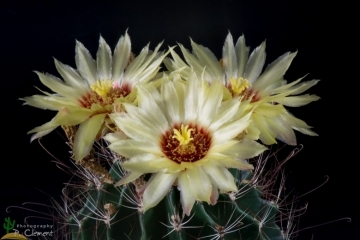 The larger stem size is sometimes confused with Ferocactus hamatacanthus var. sinuatus, which has all-yellow flowers. Thelocactus setispinus flowers have red centers. Habit: Solitary, rarely sprouting near base to produce 2-3 branches, but sometimes forming large clusters, often branching or budding above. Stems: 7-15(-30) cm high, 5-9 cm in diameter, globose to elongate globose, when young, growing cylindroid later, yellow-green to dull blue-green. Ribs: 12-15, more or less oblique or twisted, thin, high, undulate on the margin, not tuberculate 1-2 mm wide, 14-18 mm high. Areoles: 5-9 mm long, 2-3 mm wide, 20 mm apart, with extrafloral nectaries. Radial spines: 9 to 17, slender, often 4 cm long, some white, others brownish, radiating, straight, 9-24 mm long. Central spines: 1 to 3, longer than radials of which one, yellowish white to red, erect, hooked, 16-27 mm long. Flower: Radial, 4-5(-7) cm long, 3-4cm in diameter, yellow, with a deep red centrer. Pericarpels scaly. Tube will developed. Inner perianth-segments oblong, acute, widely spreading. Stygma lobes pale yellow to white. Blooming season: Summer to Autumn (Fall). Fruit: Round, to ovoid, red with white pulp, 8-15 mm long, 10-14 mm in diameter, scaly, nearly naked, fleshy at maturity, indehiscent. Seeds: 1,2 to 1,7 mm long, 0,5-0,8 mm in diameter, finely tuberculate. Thelocactus setispinus (Engelm.) E.F.Anderson: has usually hooked central spines. Flowers yellow with a red throat. Distribution: USA (Southern-Texas) and Northern Mexico (Taumaulipas, Nuevo Leon and Coahuila). 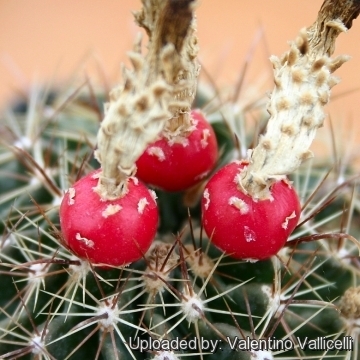 Thelocactus setispinus f. flavibaccatus (G.Unger): has yellow fruits. Thelocactus setispinus var. hamatus (Muehlenpf.) Pilbeam: has long always hooked central spines. Distribution: USA (Southern-Texas) and Northern Mexico (Taumaulipas, Nuevo Leon and Coahuila). Thelocactus setispinus var. setaceus (Engelm. ): has very thin spines. Distribution: Rio Grande City, Jim Hogg and Starr County, Southern Texas, USA. Thelocactus setispinus cv. brevispinus hort. : has short central spines. Cultivation and Propagation: This species is easy and well worth growing. Require little care once they have reached a nice flowering size. Thelocactus setispinus is suited for any rich, well drained soil in full sun throughout the year (But do better with some light shade in summer). Pot culture: grow best in a well-drained container filled with a porous cactus soil mixture that doesn't contain too much humus. To insure robust plants water and fertilize during the aestival growth cycle, this plant need plenty of water (indicatively to about once a week) But needs to be avoided wetting the bodies of these plants while they are in sunlight. 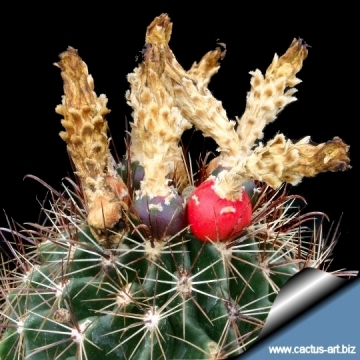 A wet cactus in the sun light can cause sun burning which can lead to scars or even fungal infections and death. Care must be taken to prevent sooty mould forming on the sugary secretions from near the areoles. Propagation: Seeds or cutting. Seeds are the typical way of reproducing. 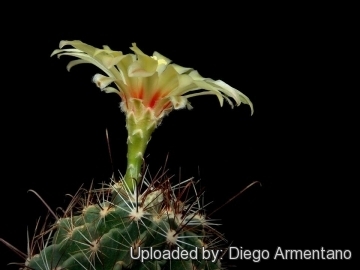 These cacti will easily grow from seeds and some from cuttings. 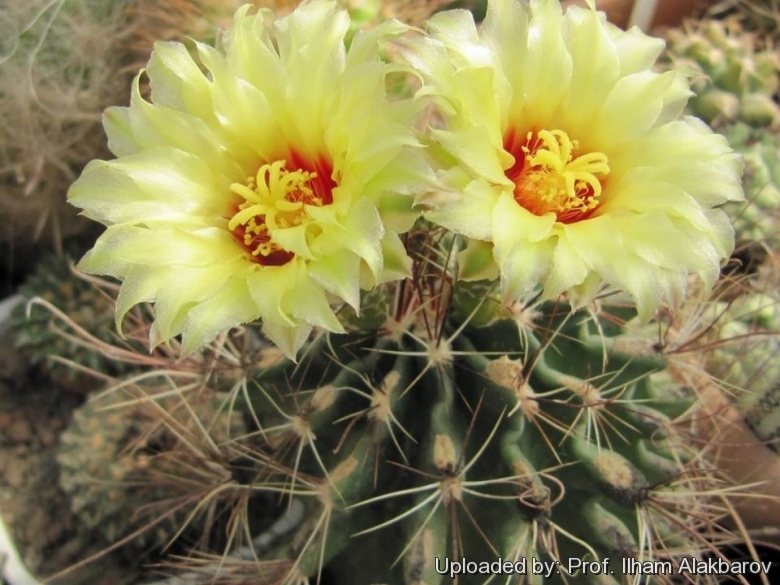 Seeds can be sown in the spring or summer in well-drained pots of soil for cacti and sow the seeds thinly on top. Cover them with a bit of fine quartz grit. Moisten and lay a piece of glass across the top. The pots should be set in a warm greenhouse until they start to sprout after which the glass should be progressively removed so they can receive full light and air. It isn't good to keep the glass over the seedlings. The seedlings well developed can be planted separately in small pots.